If you’re a bacon purist, you may not believe that “real” bacon could come from anything other than pork. 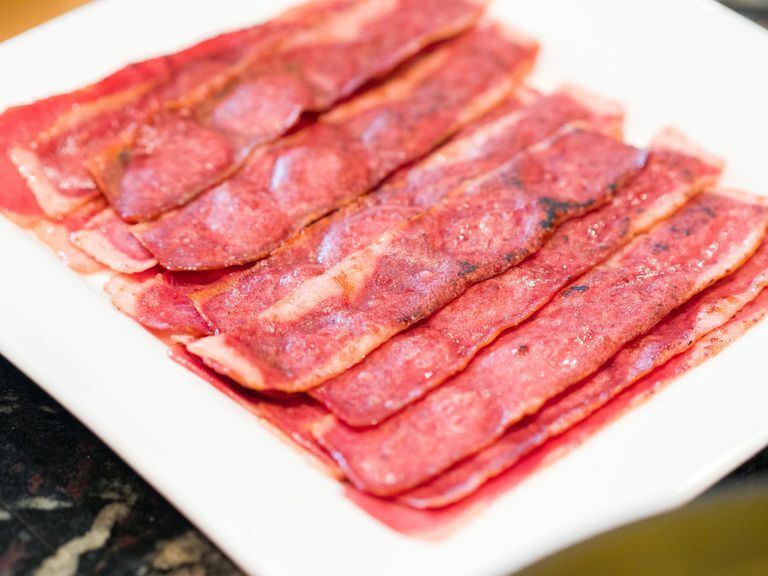 But in recent years, amidst mounting concerns over red meat’s impact on heart disease risk—and a general desire to eat healthier—many consumers have turned to turkey bacon as a lighter alternative to the traditional breakfast meat. Here’s a look at the health benefits of turkey bacon, and whether it’s really better for you than the pork variety. Other than added flavorings and preservatives, turkey bacon is 100 percent meat, so it contains almost no carbohydrates. Some brands list up to 1/2 gram of carbohydrate per two-slice serving, which likely comes from sugar added for sweetness. Two slices of turkey bacon contain anywhere from 2.5 to 4.5 grams of fat, broken down into about two-thirds polyunsaturated and monounsaturated and one-third saturated fat. Since a high saturated fat diet is associated with cardiovascular disease, the American Heart Association recommends limiting your intake to around 13 grams per day on a 2,000 calorie diet. However, since one serving of turkey bacon provides only around 1 gram, it can certainly be a part of a heart-healthy diet. At 4.7 grams per serving, turkey bacon provides a significant dose of the Daily Value recommendation of 50 grams. The primary micronutrient found in turkey bacon is sodium. Depending on how it’s preserved and processed, turkey bacon can contain up to about 360 milligrams of sodium—15 percent of the recommended daily amount. People on a low-sodium diet may need to be mindful of how much turkey bacon they consume. Other nutrients in turkey bacon include small amounts of B vitamins and zinc. When it comes to turkey bacon, there’s one question on everyone’s mind: is it actually healthy? Specifically, is it a better choice than regular bacon? Compared to pork, it’s true that turkey bacon does offer a number of advantages. A single slice of turkey bacon contains 30 calories, compared to 40 calories in pork bacon. As for fat, turkey comes in at about 2.5 grams total fat and .5 grams saturated fat per slice, while pork packs 3 grams total and 1 gram saturated. Sodium content may vary by brand, but most turkey bacon contains minimally lower amounts than pork. In other ways, though, pork bacon offers more nutrients than its white meat counterpart. Certain vitamins, like selenium, vitamin B12, and niacin are more abundant in regular bacon, and pork contains a bit more protein than turkey (3 grams versus 2 grams per slice), though both are good sources of this macronutrient. Despite these advantages, turkey bacon is still considered a processed meat, and according to the World Health Organization, all processed meats should be eaten sparingly. What part of a turkey does bacon come from? As you may be aware, traditional American pork bacon comes from the belly of a pig—hence its extra fat. According to Cook’s Illustrated, “an equivalent cut of meat just doesn’t exist on a turkey.” So, what part of a turkey is turkey bacon? Two types of turkey bacon exist, and they come from different parts of the bird. The first is made from ground white and dark meats from various sections of the turkey. This mixture is brined and sliced into strips. The second version of turkey bacon is made with larger chunks of dark meat from turkey thighs, which are tumbled in a flavoring solution until they cohere into a mass. This mass is then sliced and packaged. Does turkey bacon contain nitrates? A common concern for many consumers about regular bacon is its content of nitrates. When these synthetic preservatives enter the body, they’re converted into compounds called nitrites, which have been linked to cancer. So how does turkey bacon stack up as far as this potentially harmful additive? All bacon—turkey included—is processed with nitrates, whether the synthetic kind or “natural” kinds like celery juice. (The body doesn’t distinguish between synthetic and naturally occurring nitrates, so it really doesn’t matter which type you consume.) On the plus side, however, scientists are still sorting out exactly whether nitrates are the real underlying link between processed meats and cancer. Some believe that it’s the heme iron and high cooking temperatures, rather than nitrates, that makes bacon carcinogenic. Turkey bacon’s lower content of heme iron might mean it’s less carcinogenic than pork. How do I choose a healthy turkey bacon? As with any packaged food, one of the best ways to ensure you choose the healthiest option available is to read nutrition facts labels. When grocery shopping, take a moment to compare the numbers and values on these panels of various turkey bacon products. Pay special attention to sodium and saturated fat content, as these tend to be the nutrients of most concern in turkey bacon. In general, you can cook turkey bacon the same way you would cook pork bacon: pan-frying, baking, and microwaving are all recommended. The length of time required to cook turkey bacon to doneness may differ from pork, however, so be sure to follow package instructions. It’s important to remember, too, (because turkey is poultry) that it is cooked to a higher temperature than pork. Poultry is considered safe to eat when it reaches an internal temperature of 165 degrees Fahrenheit, whereas pork only needs to be cooked to 145 degrees. Cooking with turkey bacon may involve a bit of a learning curve if you’ve only ever used the traditional variety of pork bacon. While this white meat option can easily stand in for pork bacon in many recipes, don’t expect to be a perfect substitute. Because of its lower fat content, turkey bacon may not get as crispy as pork, and may not crumble as easily. Still, for salty, meaty flavor with fewer calories and fat, it’s an alternative worth exploring. New to turkey bacon? Get started with a simple Broccoli Salad with Turkey Bacon. Or use it to replace Canadian bacon in a satisfying Spinach and Quinoa Breakfast Mini Quiche. To start on a smaller scale, use turkey bacon in a chicken and shrimp gumbo, where it serves more as a seasoning than the star of the show. For most people, turkey bacon is unlikely to cause any adverse reactions. If you’re able to eat both turkey meat and pork bacon without issue, you’re probably in the clear to enjoy turkey bacon. However, some additives may pose problems for those with food sensitivities. If you know you need to avoid synthetic nitrates, do not consume turkey bacon. When in doubt, consult with your doctor or healthcare professional. American Heart Association. Saturated fat. World Health Organization. Red meat and processed meat. Cooks Illustrated. The Best Way to Cook Turkey Bacon. Which Is Healthier: Butter or Cream Cheese? What Is Tempeh and Is It Healthy? Are Carrots a Good Addition to Your Diet?